Us old fellas need to pace ourselves so it took us a fair while to struggle out onto the street this morning. For breakfast I did without the noodle soup this morning and had something approaching the full English, then headed out into the chaos that is Hanoi’s old quarter. It’s difficult to describe just how full on this city is, with motor scooters converging from all directions at intersections in an unrelenting stream along with cars, bikes, cycle rickshaws, busses, three wheel trucks and old ladys pushing bikes laden with enormous piles of stuff they are trying to sell. Even walking along a street is a challenge because that footpath space not occupied by people sitting on low stools, conducting their business, eating or having a family picnic is often fully occupied by parked motor scooters. This forces you out onto the street and you just have to hope the motorcycles go around you. Crossing a road can be done but it takes real fortitude, even with a traffic light cross signal there will still often be scooters coming through at speed, and you will wait at pedestrian crossing indefinitely for a gap, so you just have to take the risk and walk slowly across hoping vehicles will go around you. After a couple of wrong turns I found the market I was looking for, a vast multi storey property with literally thousands of small stalls. Walking through an enormous area where each stall sold shoes then an area of children’s shoes, or sunglasses, or watches where the walkways were often only one person wide was a challenge because vendors would be wrapping or carting goods in the same space and there would be a constant stream of shoppers trying to go both ways. This afternoon Mark and I walked to the Temple of Literature, an historic university dedicated to Confucius. This was a more peaceful spot which, today seemed to be occupied by graduating students being photographed. 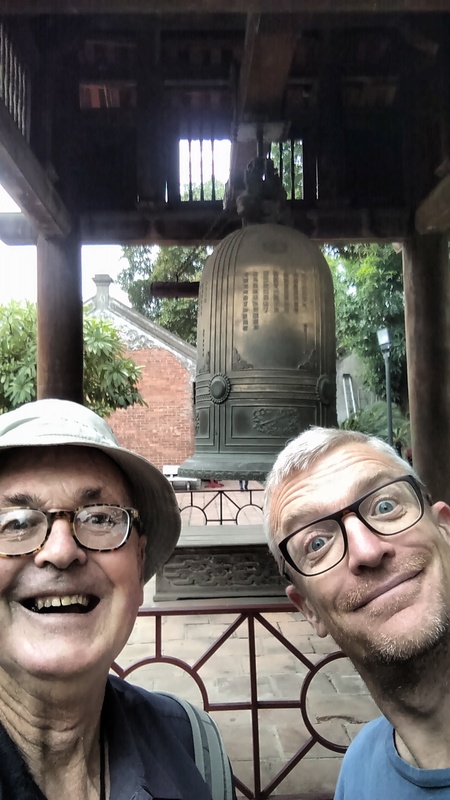 Mark and I decided on taking a selfie with the big bell because we didn’t want to be the only ones not doing so. Lovely photo of father and son.